When it comes to media tie-ins - whether it be movie, television, or comic book - one name that consistent comes to mind is Greg Cox. Winner of 3 Scribe Awards from the International Association of Media Tie-In Writers, Cox has adapted everything from The Avengers, Batman, and Buffy, toXena, The X-Files, and X-Men. He is also the author of two dozen novels and short stories in the various Star Trek universes, with Miasma being his first Star Trek e-book. The plot itself is simple, with Spock, McCoy, Chekov, and a few red-shirts sent to investigate an alien signal coming from an unexplored planet. Things begin to go wrong from the start, when their shields produce an explosive reaction in the atmosphere, and then quickly get worse when they crash their shuttle craft in the middle of a swamp. As if that weren't enough, their phasers are just as dangerous as the shields in the planet's atmosphere; their communicators are useless; and there are massive, man-eating leech-like monsters hunting them in the mist. In many ways, this plays like an sci-fi horror story, more akin to the Alien orPredator franchises than Star Trek, but Cox's mastery of the characters, the mythology, and the humor of the series makes it work. It seems like an entirely helpless situation, with a pair of red shirts getting eaten early on, but clever touches - like weaponizing Spock's coppery blood - remind us of the optimism and camaraderie of Gene Roddenberry's vision. Captain Kirk is really a secondary character here, although there is one tongue-in-cheek reference to his old womanizing ways, while Saavik is used exceptionally well. 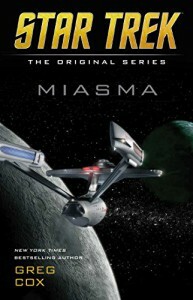 Although it originated as an idea for Star Trek: Voyager, Miasma works even better as a Star Trek: The Original Series story. Not only does it give us a chance to revisit the cast of the original (i.e. pre-Abrams) series, but it allows Cox to weave in characters and story elements from the original movies. In addition, as a relatively short novella of approximately 100 pages, it makes for a more concentrated and intense story, which is perfectly suited to be consumed (much like an episode of the original series) in a single sitting. Fun, action-packed, intense, and humorous all at the same time, Miasma reminds of what Star Trek can be, when it's in the right hands.